The Spartus Miniature was made by the Utility Mfg. Co. of New York 'Made in U.S.A.' The body is made of sturdy, dimensionally stable Bakelite (TM) plastic with metal fittings. The lens and shutter mechanism is extended from the body on a metal barrel. The camera is equipped with a Wollensak Minivar 50mm single element uncoated, uncorrected, fixed-focus lens. The name and other information is on a metal washer fastened to the lens housing. The shutter speeds are INST. and TIME selected by the small lever at the lower right of the lens. Shutter release is at upper left.The 'instantaneous' speed was probably about 1/50 sec. The lens opening was probably f/11. The fixed focus distance was roughly 5 feet to infinity. The camera has a brass tripod socket. The view-finder was centered over the lens so that lateral parallex was not a problem. The back was held in place with a fixed clip and a spring tensioned clip. A very good spring is fixed under the clip; it is not a simple springy clip such as many cheap cameras have. Most roll-film cameras have only one frame positioning window, but since this is a half-frame camera, it hase 'A' and 'B' windows. The frame number is first postioned at 'A' and, after an exposure is made, it is moved to 'B' and a second exposure is made on the other half of the frame.. 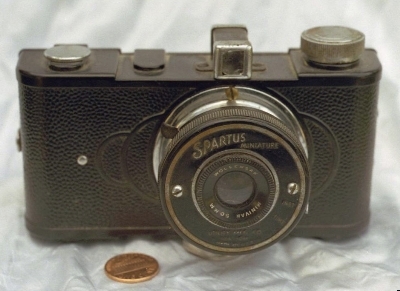 The Spartus Miniature did not have a film pressure plate. 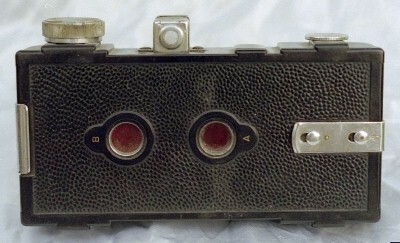 This was typical of roll-film cameras. 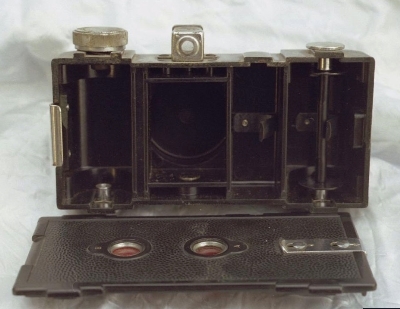 An unexposed roll of film was placed in the compartment on the right. An empty spool is shown in the photo. A spring-metal clip is riveted to the body to maintain tension on the roll. The paper back is then threaded across to the take-up spool on the left. The take-up knob is racheted to prevent reverse motion. This helps maintain tension on the film to keep it flat across the back of the exposure chamber. A compartment just to the right of the exposure chamber is provided for storage of a spare roll of film. The sturdy metal tripod socket is visible just below the exposure chamber. This image illustrates the half-frame format. It was scanned from a contact print of the four half-frame negatives which occupy the places of two full-frame negatives. There is usually a little overlap in the half-frame pairs. The image is approximately actual size. "KODAK SAFETY FILM" is printed along the edge of the film. This is a picture of the end of a roll of 127 film. The numbers indicate the frames. Some cameras took 12 square frames and others took 8 rectangular frames. The Spartus Miniature took two images on each of the 8 rectangular frames. Photographers normally would not see this paper backing unless they were accidently exposing the film to daylight or had processed the film themselves. The silvery gray roll is the film itself and it would normally roll up under the paper backing.